Although the consumption of mate is not widely popular outside of South America, the reputation of this herb is quickly growing worldwide, as science is revealing its benefits and medicinal properties. Regarded by its advocates as a better pick-me-up than coffee, mate, also known as yerba mate or mate herb, has been one of South America's most popular herbs for thousands of years, offering a host of health benefits along with an energy boost. Experts believe the first mate plants to have come from subtropical South America, as wild populations grow today in southern Brazil, Paraguay, Uruguay, and northern Argentina. Its first instances of human use date back to pre-Columbian times. Increasing alertness. Mate is mostly consumed due to its stimulating effects on the nervous system, which can reduce drowsiness and even provide relief for headaches. Stimulating urination. Due to its diuretic properties, which can reduce fluid retention in the body, mate consumption promotes the elimination of waste materials through the urine. Lowering cholesterol. Drinking mate has been shown to decrease dangerous levels of cholesterol in the blood. Because of its appetite-suppressing effect, yerba mate is also traditionally consumed to help control body weight. Mate's most active components are its xanthines, specifically caffeine, theobromine, and theophylline. These three substances all act as stimulants to the central nervous system, which decreases drowsiness and helps to keep people awake and alert. Furthermore, pantothenic acid contributes to reduce fatigue. XANTINES ALSO HAVE A DIURETIC EFFECT, WHICH HELPS TO ELIMINATE THE LIQUIDS OF THE BODY THROUGH URINE. Yerba mate also contains saponins and nicotinic acid, which both have been shown to help lower levels of cholesterol in the blood, which can be beneficial to the heart. Unlike coffee, teas, or other drinks made to increase alertness, mate contains essential minerals that are highly advantageous to human health, such as aluminum, iron, manganese, potassium, and zinc. The leaves also have vitamins A, B₁ (thiamine), B₂ (riboflavin), B₃ (niacin), C (ascorbic acid), and E.
Other herbs well-known for their stimulant properties are coffee, guarana, and the tea plant, particularly in the form of green tea. Mate is possibly safe when taken in small amounts for short periods of time, although the caffeine content in the herb may cause insomnia, anxiety, nausea, increased heart rate, and increased blood pressure. Preliminary investigations have suggested a possible link between consumption of high doses of mate for extended periods of time, with certain cancers. Although further research is necessary to prove this link, it is recommendable to avoid excessive consumption of mate. Mate can cause interactions with several different drugs, and it should not be consumed while taking other stimulants, certain antibiotics, estrogens, lithium, medications for depression, drugs for blood clotting, nicotine, alcohol, diabetes, or any medications that influence the body's ability to break down caffeine, such as birth control pills. Mate is also not recommended for use for people suffering from alcoholism, anxiety disorders, bleeding disorders, cardiovascular disease, diabetes, irritable bowel syndrome, glaucoma, high blood pressure, or osteoporosis. Additionally, pregnant and breastfeeding women should avoid mate. Bitter by themselves, yerba mate tree leaves are not eaten fresh. However, the mate plant is often brewed into a warm infusion, which is its most traditional use. Infusion. Traditionally, yerba mate tea is made following several very specific steps involving the correct container to use, as well as the temperature and timing of the added water. Mate infusion is drank for increasing alertness, flushing excess of fluids, and lower cholesterol. Tincture. The essential phytocompounds of mate plant leaves are extracted into a tincture that helps reduce cholesterol levels, as well as increasing energy and alertness. Approximately 20 - 30 drops of yerba mate tincture can be taken up to three times per day, and it can be added to other drinks to mask the taste. Capsules. This supplemental form can also provide yerba mate benefits without the bitter taste of the leaves. Yerba mate capsules are most often used to increase alertness. Dried yerba mate leaves are an increasingly common sight in health food stores and even some supermarkets today, though they are easier to find year-round in South American countries. They are also generally available via online retailers. Food products that feature the mate herb as an ingredient, such as drinks, energy bars, and cookies, can be found in organic stores in select locations. Supplements made from yerba mate are carried by some specialized health food stores, though online outlets usually provide a wider range of possible brands, concentrations, and price points. Specific rainfall requirements limit successful yerba mate tree growth to subtropical regions that receive no less than 47 inches (1,200 mm) of annual precipitation, as well as hot and humid environments - ideally around 71°F (22°C). The mate plant is propagated by seeds, which must be sown in nurseries immediately after harvesting or they will lose their ability to germinate. After 30 - 60 days, the seedlings can be transplanted into the final growing location, ideally with nitrogen-rich soil and adequate fertilization. Though it prefers heavy rain and warmer zones, the yerba mate tree can inhabit mountainous climates and survive frequent snowfalls, as well as short-term temperatures as low as 21°F (-6°C). Mate leaves should be harvested when the fruit is ripe, usually between March and June. Mate is a dioecious evergreen tree. It can reach heights of 60 feet (18 m), but usually only grows up to 20 - 25 feet (6 - 8 m). It has large, alternate leaves with a deep central vein. The flowers are small and white, giving way to reddish, single-seed fruit. The leaves are the only part of the yerba mate plant that is used for significant purpose. 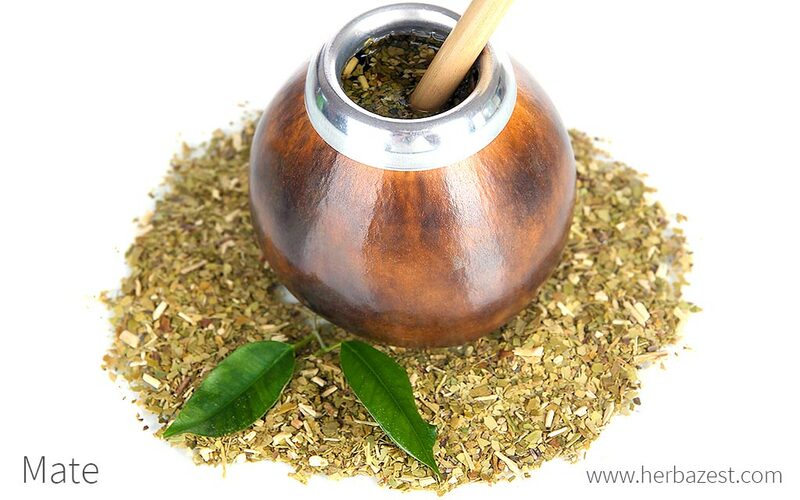 Mate, or yerba mate, may also be called Brazilian tea, Paraguay tea, chimarrao, or Cimarron. A member of the Aquifoliceae, the yerba mate tree - or Ilex paraguensis - is one of up to 600 species of flowering plants in this family. These species include European holly (Ilex aquifolium), popularly used as a Christmas decoration, and its American counterpart, winterberry (Ilex verticillata). Mate has no distinct subspecies, but two varieties of the yerba mate tree do grow in the wild. Ilex paraguariensis var. paraguariensis is suitable for human consumption and noted for its almost completely hairless leaves. Conversely, I. paraguariensis var. vestita has densely hairy foliage and it is not industrialized, though it coexists naturally with the former in some parts of Brazil. It is thought that the Guaraní people, who lived in the highlands between modern-day Brazil and Argentina, were the first to teach Spanish settlers about yerba mate benefits and medicinal uses. By 1670, Jesuit missionaries across northern South America were cultivating the plant on large plantations, sending it back to Portugal and Spain where it grew in popularity. When the Jesuits were expelled from Spanish territories a century later, both deforestation and a lack of interest forced production into steep decline, though it was never completely abandoned. By the end of the 1800s, the mate plant had bounced back to a level of popularity that hasn't waned since. Peaks and valleys in mate's history of production have led to stunted exportation outside of South America, but international demand for the mate herb continues to grow as word of its health benefits spreads. Brazil gains the most from production today, generating over $36 million USD from 2007 sales alone, though the country is closely followed by Argentina, and Paraguay also sees profits from the industry. The dried leaves of the yerba mate plant are mainly sold for use as a tea, and demand, particularly in the Middle East, has increased considerably in recent years. Many indigenous groups in South America have passed down stories and legends about the origin of mate for centuries. These stories vary among the different tribes, but many include gods and goddesses - such as the moon or the dusk - giving mate to the people as a gift for their hospitality or kindness. Because of mate's popularity as a culinary and medicinal herb, it has very few other uses. It has begun to be used occasionally in some cosmetics, although it is still not a common ingredient. Mate has a long history of consumption in the subtropical regions of South America, and modern science has confirmed that among its main health benefits are the ability to energize, stimulate urination, and reduce cholesterol.